If you’ve been paying attention, you know by now that Rotary Youth Exchange isn’t really just a year abroad. It’s a year of orientations and conferences in preparation to leave; it’s a year of adventure, challenge, love, and heartache; and then it’s time to come back for more conferences as a Rebound and Rotex student. Rebounds are our students who have just returned from their year abroad. Some of them are off at college or work, while others are finishing up their final year of high school here in the USA. This is a year of transition for them, as they re-adjust to life in the USA. They spend time reflecting on the changes in themselves as they work to reintegrate themselves into their families, school, and friendships. Many find themselves torn between the two cultures of their home country and their “second” country. Our District 6220 commitment to our Rebounds is to provide a support network as they transition back to life here in the USA. Shortly after their arrival, we conduct a Rebound Weekend Retreat for them, at which time they can share their experiences with fellow Rebound students who understand what the exchange year brought to their lives. A District facilitator works with them to explore their life coming back to their homes. Rotex students have been back for more than one year, and they and the Rebounds are welcome additions to our District Conferences, as they bring a fresh perspective to our Outbounds and parents as to what it’s “really like” to be an exchange student. Their insight and advice is invaluable, and they will continue to serve as resources and role models to our new students. 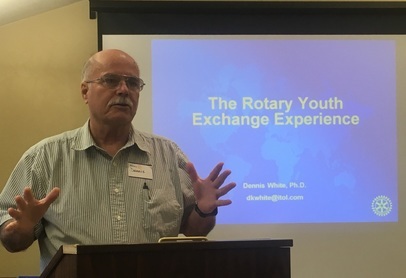 Dr. Dennis White is a clinical psychologist based in Sturgeon Bay, Wisconsin, and is world-renowned expert in culture and cultural assimilation. He works extensively with youth exchange organizations throughout the world, along with the Peace Corps and other adult organizations that have multi-cultural assignments, but his passion is for the Rotary Youth Exchange program. We’re pleased to have Dr. White as a frequent attendee and contributor to our District RYE program, and we in District 6220 are proud to share him with many multi-national Rotary Youth Exchange organizations around the world.